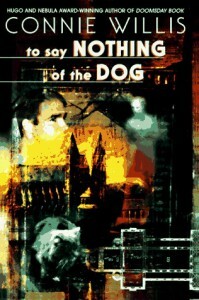 To Say Nothing of the Dog, Connie Willis, Bantam Spectra, 1997, ISBN 0-553-09995-7, $23.95, 434pp. I was anxiously awaiting this book, having heard Connie read the first chapter of it twice: once at a reading at the Little Bookshop of Horrors in Arvada, Colorado and again last year in San Antonio at the World SF Convention. It promised to have everything I loved in a Willis story: screwball antics, quirky characters, and an undercurrent of something serious. The book was not a disappointment for me, although I have noticed that many reviewers have not been as accepting. Considering Willis’ last full-length novel, Doomsday Book, To Say Nothing of the Dog is quite a departure in style, although the SF elements are the same. Doomsday Book was all about the plague, and, frankly, there’s not much to laugh about in those dark days. The new book is set mostly in the fin-de-siecle of England, those glorious days of men in spats and church socials. The actual time period never existed, or existed only for a few people, but the books that have been set in this period are legion, among them almost all of P.G. Wodehouse’s oeuvre and the direct ancestor to the book in question, Jerome K. Jerome’s Three Men in a Boat. The central plot device is a missing item called the Bishop’s Bird Stump. It somehow disappeared from the Coventry Cathedral around the time of the Cathedral’s demise in the Blitz of World War II. But wrapped up in the Bird Stump hunt is Willis’ time travel conceit, in which history refuses to be changed, and morphs itself back in line no matter what visitors from the future try to do. One of the ways it accomplishes this is to refuse to “open a window” into a time period that is a deciding moment of history, say, the battle of Waterloo or Kennedy’s assassination. It also will “slip” a traveler’s entry point by time or space to prevent them from interacting to the detriment of history. As an SF novel, this is abject failure, I feel. I found it absolutely impossible to believe in the “great men, great moments, great ideas” version of history–that, as long as these were constant, the rest of history continues to fall in place. It is a little easier to believe in than the Everett-Wheeler-Graham model that says infinite worlds are being created constantly in an ever-growing tree of decision branches. Perhaps I feel it doesn’t address Ray Bradbury’s elegant look at time travel in “A Delicate Sound of Thunder,” in which things go to hell because a time traveler kills a butterfly in the past. Willis’ SF was never of the hard type, though, so criticizing her novel on the basis of technical mumbo-jumbo is silly. Because as a humorous novel, this book truly shines. Her SF concepts are merely the stage props that allow her to mix an unlikely cast of characters together. Earlier this year, John Kessel paid homage to Preston Sturges in Corrupting Dr. Nice; herein, Willis worships the very text on which Jerome K. Jerome blotted his fountain pen. Both authors work in concepts that keep their books tied to the field, but whereas Kessel achieved great results in philosophical metaphysics on the nature of ethics and time travel, Willis never really abandons the humor. Her’s is the more tightly constructed, plot-wise, and is as perfect in its humor construction as those carefully constructed “musical comedies” that Wodehouse wrote. In contrast, Kessel’s has some deep concepts that stay with the reader after the last page is finished. Aw, why deny yourself–enjoy both!